Deducting business expenses is one of the single most powerful tools in any tax-preparation strategy, and is often one of the most misunderstood. In this article, we will discuss who can qualify for business expense deductions, what expenses can be deducted, and how your deductions must be recorded and reported. The information discussed in this article is relevant to entrepreneurs, self-employed people, business owners and shareholders, and employees who have paid out-of-pocket business expenses. What Business Expenses Can Be Deducted? Cost Of Goods SoldÂ – The cost of any goods or raw materials you purchase and resell is always 100% deductible. For example, a woman who sells paintings at a local craft show will be able to deduct the costs of paint and canvas for each piece sold. Business Supplies & Tools -Â The cost of any supplies and tools needed exclusively for business use are fully deductible. For an artist, any purchases of paintbrushes, easels, and other supplies can be deducted. Vehicle Expenses -Â Certain vehicle expenses – including rental costs and mileage – can be deducted for qualifying business use of your vehicle. Commuting expenses cannot be deducted. Contract Labor & Services -Â If you hire contractors or freelancers to work for your business, fees are fully deductible. You can also deduct fees paid to hire professionals such as lawyers and repairmen for business-related services. Office Expense -Â You can deduct any costs associated with maintaining your business workplace or office. If you work from home, you can deduct the percentage of your home costs directly related to your business. Travel & Entertainment -Â You can deduct travel-related business costs, and up to 50% of your qualifying business entertainment costs. All travel and entertainment costs deducted must be related solely to your business, and cannot include any recreational expenses. Additional deductionsÂ including depreciation, depletion, taxes, and insurance premiums may also be deductible based on your particular situation. Who can deduct business expenses? Business expenses are normally associated with corporations – entities which are distinct and separate from the owner(s) and employees. In most cases, business expenses are reported on a corporate income tax return instead of on a personal income tax return. However,Â there are a variety of situations in which you, the taxpayer, may wish to deduct business expenses on your own personal income tax return. If you are a self employed professional, own a home-based business, or are a shareholder in an S-Corporation or partnership, your business deductions can be listed directly on (or passed through to) your personal income tax return. If you are an employee who has paid business expenses out-of-pocket, you can deduct some or all of your business expenses by itemizing them on Schedule A of your personal income tax return. If you are the sole proprietor of an unincorporated business or an LLC (which is an unincorporated business to the IRS), you can deduct all qualifying business expenses directly on your income tax return by filing Schedule C. In order to be qualified as a business, you must engage in related business activities with “continuity and regularity” with the intent to make a profit. Common examples of individuals who can claim Schedule C business expenses are self-employed professionals (contractors, consultants, photographers, etc), individuals who run a home-based business (such as a childcare service, a regular booth at a local market, etc). Most business activities that are not associated with an incorporated entity are reported on Schedule C.
As the owner of a Schedule C business, you have the right to deduct all qualified business expenses from your gross business income – resulting in either a net gain, or a net loss, to your Adjusted Gross Income. You must list your deductions in the Business Expenses section of Schedule C (seen below), and retain receipts to prove your expenses in the event of an audit. S-Corps and Partnerships are different from Schedule C businesses in that they can be owned by multiple shareholders. While these businesses are not subject to taxation like C-Corporations, business deductions in an S-Corp or a Partnership are reported on a business tax return and not on an individual shareholder’s tax return. If the business has multiple shareholders, the deductions – like the income distributions – will effectively be equallyÂ distributedÂ to all of the shareholders based on their investment in the company. If the business is owned by s sole shareholder, all of the deductions – and profit distributions – will flow through to that individual’s tax return as a distribution. In addition to the normal deductible business expenses, S-Corps Â and Partnerships also allow the easy deduction of wages, officer compensation, and employee benefits. 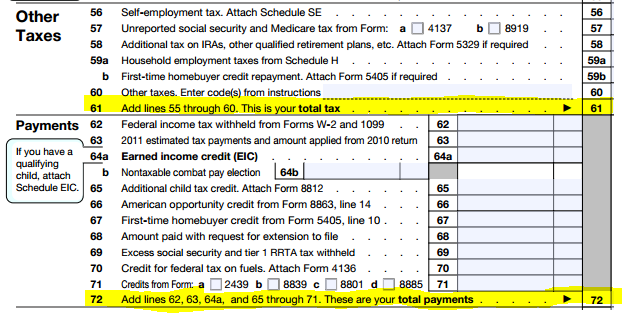 See the excerpt the expenses section of Form 1065 (partnership income return) below. While fundamentally different from deducting expenses for a business in which you are an owner or shareholder, the IRS does provide a method for employees of a corporation to deduct business expenses they paid out-of-pocket. Generally, these expenses involve entertainment of clients (such as taking a client out to lunch to discuss business) or unreimbursed travel expenses (such as hotel or meal expenses). If you itemize deductions on your personal income tax return, and your unreimbursed expenses amount to 2% or more of your AGI, you can itemize and deduct these expenses directly on your 1040. Keep in mind that general expense deduction rules, like the 50% entertainment deduction rule and mileage rates for business travel, also apply to employees claiming these expenses as an itemized deduction. To claim unreimbursed business expenses, list the sum on Schedule A (your itemized deductions worksheet) under “Job Expenses and Certain Miscellaneous Deductions”. You must also also include Form 2106, “Employee Business Expenses”, where you must itemize your expenses and make sure they qualify for deduction. Tax law is exceedingly complicated, and as many who have attempted to wade through piles of tax paperwork on their own can attest, often exceedingly frustrating to deal with manually. For many Americans who choose to handle their tax returns themselves, completing and double-checking tax forms can turn into a nightmare. Luckily, dozens of tax software suites make it possible and even easy to manage and submit your tax returns online. Tax-Rates.org has reviewed some of the best income tax software available in order to help you choose the tools that are right for you. TurboTax is a powerful tax suite that can handle both federal and state tax returns. The program is designed to ensure that you receive your maximum tax refund with simple multiple-choice questions that can help you claim over 350 updated deductions. Pros: One of the best features about TurboTax is the wide variety of time-saving tools and features available. TurboTax can import tax data from previous years (even if you didn’t use TurboTax), and can instantly load W-2 forms and other tax information directly from your employer. This can save an incredible amount of typing and time. Cons: The popular free version of TurboTax supports both federal and state returns, but only supports free e-filing for your federal return. You can print and send your state return in for free, but you have to purchase a state e-filing package ($39.95) if you want to e-file your state income tax return as well. TurboTax has four editions, ranging from free software for basic returns to a full-service tax prep suite for self-employed business owners. You can compare the features, and price, using the table below. 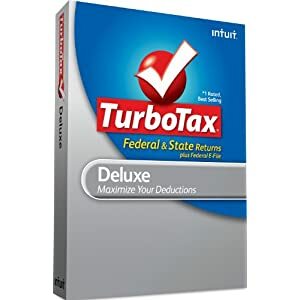 We found all editions of TurboTax to be intuitive and easy to use – the software offers turn-by-turn instructions and helpful suggestions to help you navigate through the various refunds and tax credits available, and can import and double-check all of the tax forms seamlessly in the background. Overall: TurboTax is arguably one of the most well-rounded tax suites available, and definitely goes the extra mile when it comes to saving time and maximizing your tax refund. If you have a simple tax return (with only wage income and 1099s), TurboTax Free is unbeatable for e-filing your federal return, both in ease and price. For only $49, the deluxe edition is also an excellent buy for most taxpayers that offers the same or better guidance for a much more affordable price then a professional tax preparer. Tax Return Transcript – Your Tax Return Transcript includes can copies of your 1040 and most of the add-on schedules filed with that year’s tax return. You should request a tax return transcript if you need a full copy of your tax documentation, which may be necessary if you lose your records or need to provide a copy of your tax return to a third party like a government agency or your mortgage company. Tax Account Receipt – The IRS can also provide you with a Tax Account Receipt, which is a simple document including basic information about your tax account like your adjusted gross income and taxable income. This transcript can be useful for applications that require your tax status, like the Department of Education’s FAFSA application. You can request a transcript or a receipt for the current tax year, or for any of the last three tax years. There is no fee for either a transcript or a receipt. This article will show you, step by step, how to order a Tax Account Receipt. Ordering a Tax Return Transcript follows most of the same steps. Complete lines 1-4, following the instructions on page 2 of the form, with your personal information. Sign and date the form and enter your telephone number. Only one signature is required for a joint return. Mail or fax the completed IRS Form 4506-T to the appropriate location provided on page 2 of Form 4506-. Tax return transcripts are commonly used for proof of income and proof of tax status. Below is an example of a certified IRS tax return receipt. Alaska – Alaska has no statewide income tax, and no statewide sales tax – but local governments are allowed to collect a local sales tax of up to 7.5%. Alaska has consistently ranked as the state with the lowest tax burden in the nation. New Hampshire – New Hampshire has no statewide income tax (although it does collect income tax on dividend and interest income), and no statewide or local sales taxes. Like Alaska, New Hampshire consistently ranks among the top five lowest taxing states in the nation. Although both Alaska and New Hampshire have notably low combined tax burdens, both of them – especially New Hampshire – have higher median property taxes than most other states. If you live in any of these states, you do not have fo file a state income tax return and are only responsible for paying federal income taxes on your income. While residents of these income-tax-free states do have a significantly lower income tax burden then those in high-tax states like California or Oregon, some of these states make up for lost tax revenue by raising other taxes like sales taxes, property taxes, and excise taxes. For many Americans, tax season can bring about a windfall in the form of a Federal income tax refund check. You will receive a refund check if and only if you paid more then your total tax debt over the course of the year through tax witholding. This article will teach you how to calculate your expected tax refund, and how to ensure that your refund check reaches you successfully. The size of your federal tax refund depends on two things – your total tax owed and your total tax witholding. Calculate your total tax (including all deductions, adjustments, and other taxes) on line 61 of your 1040 form. This is the amount you owe. Calculate your total tax payments on line 72. Tax payments include all incomeÂ tax withheld by your employer on line 62 (check your W-2 or 1099 forms), estimated tax payments on line 63, and any tax credits you may qualify for. The total on line 72 is your total tax paid. Your tax refund is simply the difference between the amount you paid and the amount you owe. If you paid too much, you have several options for your refund. If your total payments on line 72 are greater then your total tax owed on line 62, write the difference in the refund boxÂ on line 73. In lines 74 and 75, you can choose to have your refund paid to you (as a check or through direct deposit) or applied directly to next year’s taxes (useful if you have to pay estimated taxes). Now that you’ve calculated your refund, there are several steps you can take to ensure you receive it in a timely manner. eFile Your Tax Return – The IRS has to process millions of tax returns every year – if you eFile, they will be able to process your return (and your refund) much more quickly. eFiled returns will receive refunds in as little as 1-3 weeks, while paper returns can take up to 6 weeks to be processed. Request Direct Deposit – Requesting that your refund be direct deposited instead of requesting a check can also speed up your refund process by up to a week. Direct deposit is fast and secure, and you can choose up to 3 separate accounts (including checking, savings, and retirement accounts) to receive your refund. You can request direct deposit on line 74 of your 1040. If you eFile your tax return, you can expect to receive your refund within 10-21 days. With this information in hand, you can check the status of your refund either onlineÂ or over the phoneÂ by calling the IRS Refund Hotline atÂ Â 1-800â€“829â€“1954 or by logging onto the IRS Where’s My Refund website. If you received an incorrect refund amount, your refund was never issued , or your refund check was lost or stolen, contact the IRS immediately at 1-800-829-1040Â and they will be able to reissue your refund as necessary. If your state collects income tax, you must apply for a refund on your state income tax return, and you will receive a separate refund payment. Most states also provide an easy-to-use refund status portal – see your state’s income tax information page for more details. One of the most common misunderstandings encountered when dealing with income taxes is the concept of marginal tax brackets, and how they are used to calculate your income tax. Marginal tax brackets are a progressive tax bracket system, which means that the effective tax rate increases as taxable income increases. Marginal tax brackets are used to calculate your federal income tax, as well as state income taxes in most states that collect an income tax. In addition to personal income taxes, marginal tax brackets are also used when calculating federal and state corporate income taxes. In the media and everyday conversation, you may often hear references to somebody’s “tax bracket” – for example, “Most full-time employees are in the 25% tax bracket”. This language can help create the false impression that individuals “in the 25% tax bracket” actually pay a full 25% of their income in taxes. This is not true, as we will soon see. Due to the nature of marginal income tax brackets, the actual amount of tax dollars paid by an individual in the top half of the 25% tax bracket is closer to 18% of their total income . A marginal income tax means that the actual tax collected on each dollar you earn depends on the total amount you have earned between the first day of the tax year and the moment you earned that dollar. For example, let’s consider a simplified version of the 2012 federal income tax brackets: . Let’s say you earn a salary of $60,000 a year, or $5,000 per month. Starting on January 1st (the beginning of the most commonly used tax year), you have earned a total of $0. Like everyone else, you start in the 10% tax bracket, which covers earnings from $0-$10,000. Therefore, you will owe 10 cents per dollar in income tax for the first dollar you earn – and for every dollar you earn up to the $10,000 cap. On January 31st, you receive your $5,000 monthly paycheck. You have earned a total of $5,000 since January 1st, and all of the $5,000 you earned falls below the $10,000 cap for the 10% tax bracket. Therefore, you owe a total of $5,000 x 10% = $500 in federal income tax for your January earnings. In February, you earn another $5,000. This is also included entirely in the $0-$10,000 tax bracket, so you also owe a total of 10%, or $500, of your February earnings in income tax. So far, you’ve earned a total of $10,000 since January 1st and have paid 10%, or $1,000, of your total earnings in federal income tax. Now, because you’ve earned a total of $10,000 so far through February, you’ve reached the cap of the first tax bracket. 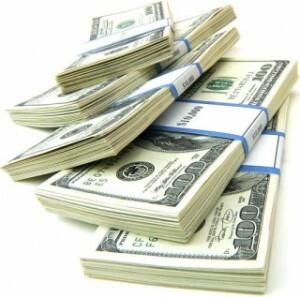 The next dollar you make, the $10,001th dollar, will be included in the second Ã‚Â tax bracket – $10,000-$35,000. In this tax bracket you will pay 15%, or 15 cents per dollar, in federal income tax. When you receive your $5,000 paycheck at the end of March, you will owe 15%, or $750, in taxes. Now, at the end of March, you have earned a total of $15,000 in wages and paid a total of $1,750 in income tax. This includes 10% of your January earnings, 10% of your February earnings, and 15% of your March earnings. You’re currently earning in the 15% tax bracket, but if we average the effective tax rate you paid on each dollar we find that you have only paid a total of 11.67% of your total income in taxes . This is the nature of a progressive tax bracket system. Here’s how the complete yearly tax breakdown looks for our example, for all $60,000 in wages earned from January 1st to December 31st. Wages are broken down into their applicable tax brackets, including total dollars earned and total tax paid in each bracket. In our example, you find yourself in the upper half of the 25% tax bracket at the end of the year but you’ve only paid 18.33% of your income in taxes – a full 6.67% lower then your current tax bracket if taken at face value. We like to call this the marginal tax bracket effect. Why does the marginal tax bracket effect seem to diminish as you earn more? It’s a simple matter of rounding. 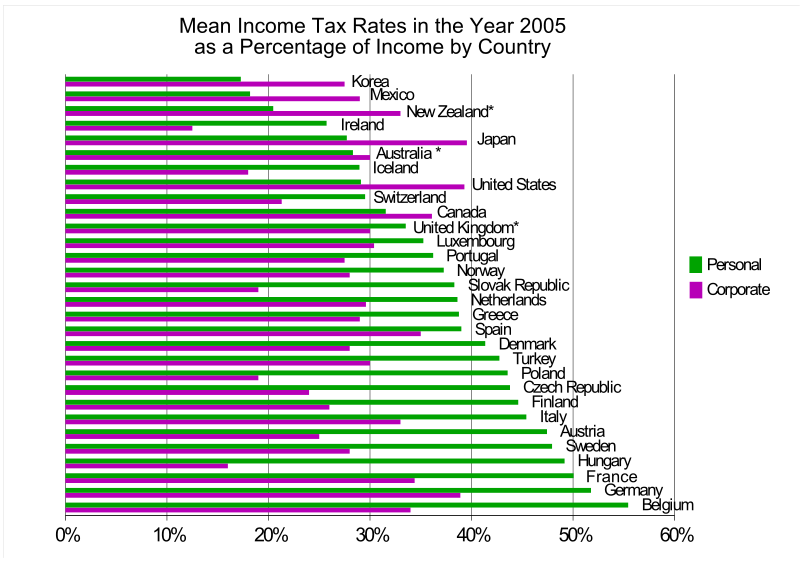 The higher tax brackets are, by design, much wider then the lower brackets. For example, compare the $10,000 wide 10% bracket with the $90,000 wide 28% bracket. With more and more of your income falling into your highest tax bracket as your income goes up, the tax savings you get at the lower brackets become statistically less significant. As you have seen in the previous examples, marginal tax brackets mean that the total percentage of income you pay in taxes is not the same as the face value of your highest tax bracket. While marginal brackets are somewhat more complicated to calculate then a simpler flat tax, they do come with benefits. Specifically, the marginal income tax system is designed to lower the overall tax burden on lower and middle-income taxpayers, while ensuring that taxpayers of all incomes pay the same marginal percentage in each respective bracket regardless of which bracket they fall in at the end of the year. As the core of the American income tax system, understanding how marginal brackets work is a key step in understanding and taking control of your finances. Armed with this knowledge, you should be better prepared to make more informed tax and financial decisions in the future. See the calculations for Example No. 1. Keep in mind that, for purposes of simplicity, none of our calculations include tax deductions, tax credits, or any other modifiers. In our example, you earned at total of $15,000 in wages and paid a total of $1,750 in income taxes. Therefore, your effective tax rate is $1750/$15000 = 0.1166 or 11.67% of your total income so far.